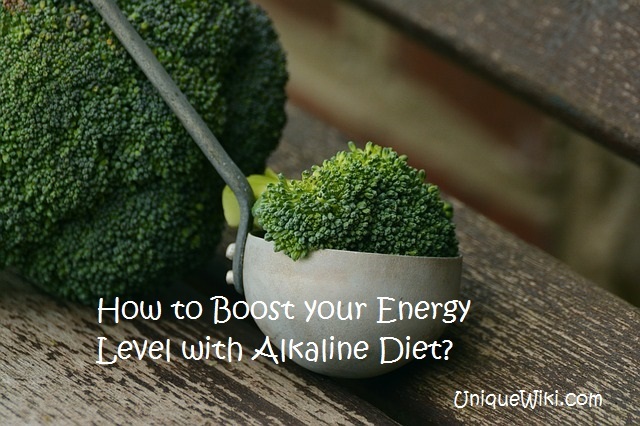 How to Boost your Energy Level with Alkaline Diet? So very true! But how many of us realize this? How many of us are utilizing our full potential or how many of us even know what we are capable of? Imagine what life would be if we make use of even half of our potential …or for that matter think about making use of even one-third of your potential…the results will be astounding! Most people don’t feel anywhere near as good as they could. Funny though, lot of people think that their growing age is responsible for their lack of energy. As we take on the challenges of our times with mounting pressure of balancing career, family and relationships, how many of us actually FEEL GOOD? How many of us even know how it feels to ‘FEEL GOOD’? What do we do to feel good…to feel energized and absolutely rejuvenated…ready to TAKE ON life… ready to live and feel every moment?? Well lots of factors contribute to this. An important one being, diet. We are what we eat. Rightly said. I have realized with small changes in your diet you can make a big difference in your life. Practicing alkaline diet has helped me immensely to regain my energy levels and live a better life. I feel I am getting more out of life now. I am eating better and definitely Living Better! Alkaline diet – a simple, cheap and easy to follow diet, will undo years of damage caused to your body and will completely re-energize, revitalize and rejuvenate your system. Alkaline diet has continued to become famous amongst men and women around the world. The concept of this kind of diet is to mainly provide a healthier body and an active mind. Let’s learn more about alkaline diet from the sources to the benefits it can provide. In every food that we eat, there are two types of residues formed in the body. The first type of food is categorized as acid-producing food. Acid-forming foods are meat, dairy products, coffee, sugar, alcohol and processed foods. The other type of food is called alkaline-producing food. These are vegetables and fruits as well as nuts, legumes, seeds and grains. The idea is simple…we should attempt to eat more of alkaline food and less of acidic food in every meal. It is important to know which food falls under which category. Coffee, sodas and alcoholic-based drinks are sources of acid, while fresh fruit juices, smoothies and herbal teas belong to alkaline. Alkaline is a compound that is produced by certain minerals that are present in most foods like the ones mentioned above. These minerals include calcium, zinc, iron, magnesium, sodium, silver and potassium. Well, the next time you cook, pick ingredients that contain those good minerals that are beneficial to the body. Alkaline has the power to detoxify the body. It fights toxins and chemicals including fat as well as calories. Every person should remove toxic compounds from the body which causes aches and pains, loss of appetite and lack of energy. Weight loss comes as an additional benefit of alkaline diet. Alkaline can reduce fat and calories giving you a lean trim body. With alkaline diet your energy levels will explode making you feel incredible within a week. Eating alkaline foods will make you feel active like a child. It will help you restore your health, gain immense mental clarity and get more out of life. Make a quick chart of alkaline and acidic food from veggies to fruits, grains to seeds, meat to dairy products. I have put up the list on my fridge and it really helps! Planning your meals with the help of this chart is a great way to get started. This way, it is easier for you to balance the intake of alkaline and acidic foods. Being on alkaline diet certainly does not mean eating boring and mundane food. There are lots of alkaline food recipes I have tried and you will be surprised how delicious and yummy they are. My husband just loves them! There are cookbooks for alkaline food and even better you can get some free recipes online. I find alkaline recipes to be easy, delicious and healthy too! Practice alkaline diet and live a healthier and happier lifestyle. The higher your energy level, the more efficient your body and mind. The more efficient your body, the better you feel and the more you will use your talent to produce outstanding results.